Free text search Search for free text to find matches across all file tags and properties including file names, comments, and untagged visual object detection (called SmartVision results). Example: Searching for the tag Wood will return any files with instances of a Wood tag. SmartTag + descendants Searches for files with a tag and/or any of its child tags. Example: If the tag Location has child tags First Floor and Second Floor, searching for 'Location - includes all descendants - Tag Search’ will return files tagged with any of the three. Alternate tags Returns files with instances of the tag or the tag it's an alternate to. Example: If tag ‘First floor’ has alternate ‘Level One’, searching for ‘Level One’ will return any files tagged with either. User name/ email Searches for files uploaded by a Smartvid user. 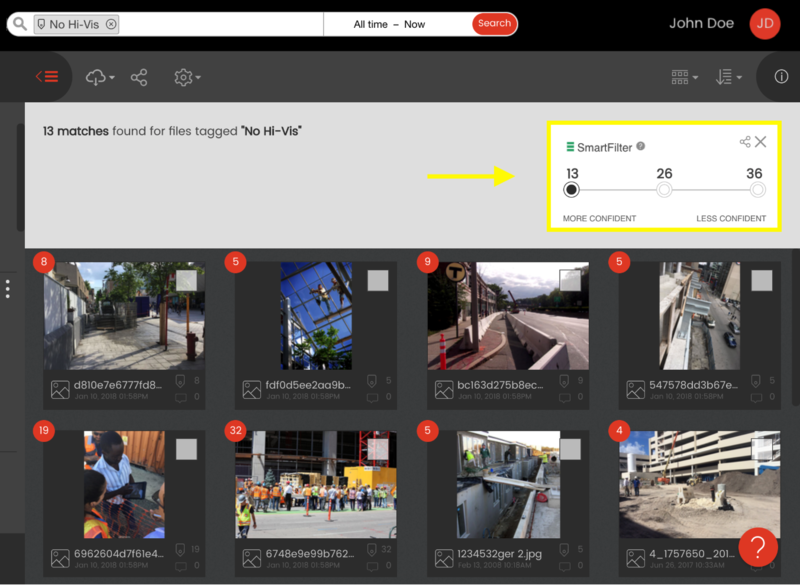 Example: Searching for the user 'John Doe jdoe@smartvid.io' will return any files uploaded by John Doe. Click on one of the category filters to see matches limited to that area. You can also use the date picker in the search bar to narrow results by date; click "All time - Now" to expand the date picker, then use the calendar to click and choose start and end dates. If you search for multiple terms/criteria, you will by default see files that match all of your entered criteria. For example, if you search for tags "Person" and "Ladder" the search results will show you files that have both people and ladders. If you want to search for files that have any of your entered terms -- for the previous example, that would mean searching for any files that have people and/or ladders, but not necessarily both - change search settings by clicking here and select the 'Search for any terms' option. Click to a lower confidence level will bring more matches that might be more speculative (think of it as going deeper in the results of the Google search). Note that every confidence level includes files from higher confidence level. In this example, the 26 "medium confidence" results include the 13 highest-confidence results, and the 36 "less confident" results include both high and medium confidence level ones. Search on high confidence for most accurate results, or lower confidence to see more options, depending on the scope and context of your inquiry. Shared searches are a great way to bulk-share multiple files with your colleagues and partners. Sharing a search creates a link that others can use to see all the files returned as results of a search. Note that search links are dynamic, meaning they update automatically to include file results that are be uploaded in the future (even those added to the project(s) after you originally share the link). From the pop-up window, select how you want to share the search results. Under People, select or add one or more persons by email. As you type, matches to emails of registered users will be auto-suggested; click on one to select it. If you enter an email address not registered with Smartvid.io, they'll receive an invite to join. Repeat for any additional people. For each person, remember to click '+' to the right to add them. Optionally, you can add a message to include with the link. Click Share Search to send. Under Share With, choose if this link should be accessible (a) only to project members, (b) by anyone in the project organization, (c) public (if your company has turned on public links). Create a sharable link (copy a URL to view the search and paste it wherever you want to share). Click Done to close the pop-up.